If you don’t want to hassle with leaves, JFK Lawn & Landscape is here to help! Fall is in full swing! If you haven’t already, now is the time to turn your attention to the landscaping of your property. There are many steps a homeowner needs to take during the fall months to keep their landscape well kept. Here is a fall landscaping checklist that you can use this season to help you ensure that everything is in order! Fallen leaves are a certainly during the fall season. It is important to realize that the leaves on your property can’t be neglected. Fallen leaves can smother a lawn and kill the grass. Also, when these leaves become wet, mold can form and attract insects. Do yourself a favor and have leaves removed on a regular basis. If you don’t want to hassle with leaves, JFK Lawn & Landscape is here to help! 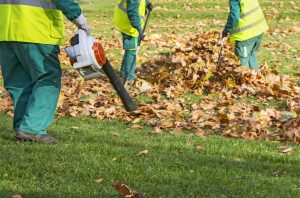 Our professional crew offers affordable leaf removal services to keep your property clean throughout the fall season! Not only are dead branches an eyesore, but they are also a safety hazard! Now is a great time of the year to survey your property’s trees for dead branches. It is important that these branches are removed before winter snow piles atop of them. Most species of young plants can benefit from a layer of mulch this time of the year. Mulch is great because it prevents soil erosion while keeping new plants warm. Also, mulch makes it more difficult for weeds to grow and provides a nice color backdrop color for many plants. In order to achieve green grass, you need your lawn to breathe! All too often, the soil will become compacted when rainwater piles up on top of it. To remedy this, you need to aerate the dense ground with small holes. This will allow it so accept air, water, and other nutrients. There are two types of aerator tools/machines: the spike aerator and the plug aerator. The spike aerator is generally a metal fork that is used for poking the ground. A plug aerator is a machine that removes cores of soil from the ground. This entry was posted on Monday, October 15th, 2018 at 4:19 pm. Both comments and pings are currently closed.